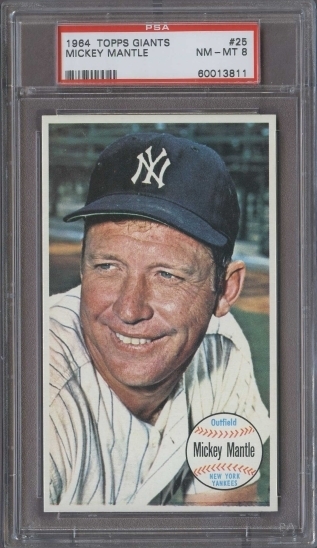 DeansCards.com has just received both a 1964 Topps Giants PSA graded complete set as well as a non-PSA graded Very Good/Excellent set. The 1964 Topps Giants baseball card set consists of 60 large size cards that measure 3⅛” by 5¼” and feature the most popular players of the time. These cards were released separately from the regular 1964 Topps in their own wax and cellophane packs. Although the set was issued as a single series, seven of the cards were short printed, making them significantly harder to collect in nice condition. The 1964 Topps Giants cards have a large color photograph on the font and a newspaper article discussing the player on the back. 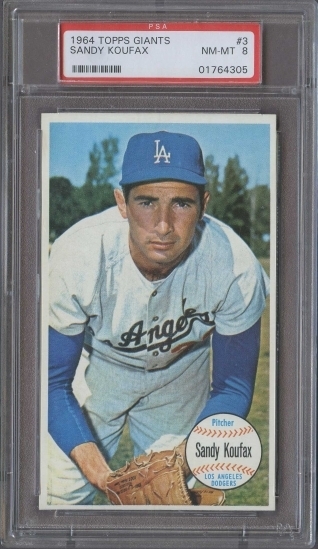 The DeansCards.com PSA graded 1964 Topps Giants set has a GPA of 8.248, which will rank approximately 18th when we register it as a PSA Registry set. Sandy Koufax, Willie Mays, Roberto Clemente, and Mickey Mantle all grade PSA 8 NM-MT. Orlando Cepeda is graded PSA 10 GEM MINT and is one of ten that exist. DeansCards.com also has non-PSA set that grades Very Good/Excellent. The short prints for the 1964 Topps Giants set can be very difficult to find. This set includes all of the short prints, but in an affordable manner. The 1964 Topps Giants set can be very difficult to collect and we rarely have even a single complete set in inventory. To see the PSA graded set, please click here. To see the non-PSA set, please click here. To view the rest of our 1964 Topps Giants inventory, please click here. If you are interested in selling 1964 Topps Giants cards or any other 1960’s cards, please click here.